Earlier this year, rocket company SpaceX wowed the world by launching their largest rocket yet — Falcon Heavy — into orbit. At 70 meters tall and nearly 1.5 million kilograms, Falcon Heavy is the largest space-faring vehicle in operation today. The payload for the maiden launch? CEO Elon Musk’s own red Tesla Roadster. This multi-million dollar stunt boosted Musk’s confidence that the company’s more ambitious rocket engineering goals will soon be achieved. Scientists at the IPD have also been designing rockets, but at a much smaller scale. In a report published in Science, a team of molecular engineers led by UW postdoc Peilong Lu describes the creation of complex “rocket-shaped” proteins which span cell membranes. In nature, transmembrane proteins mediate communication between cells, ferry molecules into and out of the cell, and are common targets for drugs. The accurate computational design of complex transmembrane proteins paves the way for new membrane-spanning proteins with novel functions. The Falcon booster on the left stands approximately 40 meters tall. 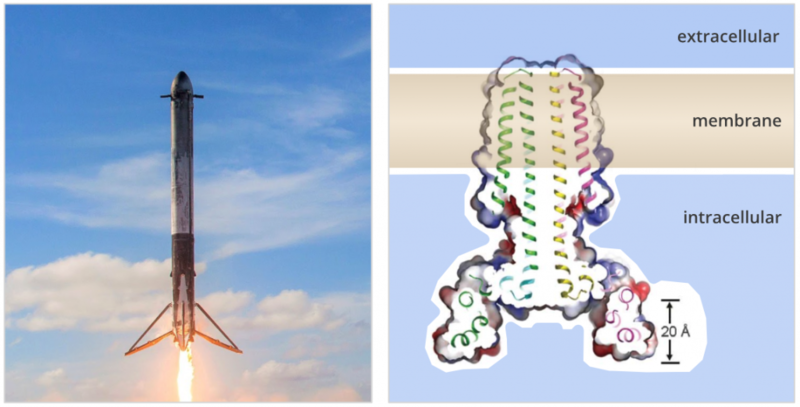 At under 10 nanometers, the designed transmembrane protein on the right is four billion times smaller. To produce well-ordered multipass transmembrane proteins from scratch, several biophysical demands had to be balanced at once. Placing hydrophobic swatches on alpha-helical structures is sufficient to generate membrane-association, but the packing and orientation of hydrophobic helices are difficult to control. A recently developed algorithm was used to install hydrogen bond networks between helices within the transmembrane region, producing programed packing specificity. Amphipathic aromatics and cationic side chains were introduced to control the overall orientation of the proteins. In vivo studies and crystallographic models of the design confirm the intended orientation, packing, and oligomeric state of the designs.